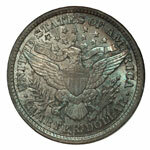 The Barber quarter series of 1892-1916 was largely overlooked once these coins passed from circulation during the 1940s. Until fairly recently they were sought mostly by type alone. The formation of a club devoted to Barber dimes, quarters and halves about 20 years ago helped revive interest in collecting them by date and mint. Since that time a number of interesting varieties have turned up, too. Grading circulated Barber quarters is a fairly straightforward task. The design is quite symmetrical, and both sides feature prominent borders and rims. As a result, these coins tend to wear very evenly. There are exceptions, as noted in the book The Official American Numismatic Association Grading Standards for United States Coins. It warns that “Most New Orleans and Denver issues are softly struck, particularly on the eagle's left [viewer's right] claw.” This will affect grading in the higher circulated grades of About Uncirculated and Extremely Fine, since this softness may be mistaken for wear. Another important point not mentioned in that book is that this coin type underwent a number of changes to its master hub. These resulted in subtle differences in relief and proportion for some design elements. The only hub change which is interest to this grading study is that of 1900, when both the obverse and reverse of the Barber quarter were revised. Among the affected features was the headband inscribed LIBERTY. This is not quite as sharply incised on coins generated from the new hubs, and all dates through the end of the series will wear a bit more quickly on this particular feature. Since the number of letters visible in LIBERTY has traditionally been one of the criteria for grading circulated Barber quarters, one must allow for its reduced sharpness on later dates. 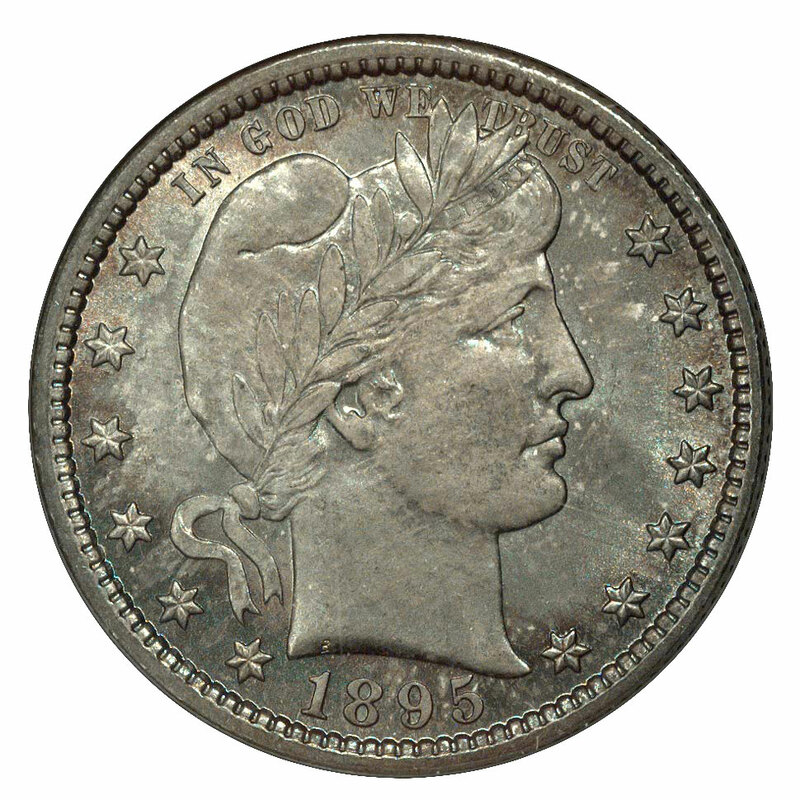 Circulated Barber quarters are typically seen cleaned to some extent, with varying degrees of success. Original coins, those which have never been cleaned in any way, are very scarce for the branch mint dates before about 1906. Harshly cleaned coins will not be graded by most grading services, including NGC, yet even the experts allow some leeway for coins of this type which have been lightly cleaned but are still natural in appearance. Mint state coins of this type will vary greatly in quality. As noted previously, those of the Denver and New Orleans Mints are often incompletely struck. Conversely, those of the Philadelphia and San Francisco Mints tend to be more sharply struck, particularly ones made from the older hubs used during the 1890s. Grading mint state coins of this type depends heavily on eye appeal, a concept which is difficult to express in writing. Professional graders look for the number of marks and other visual distractions, particularly those which occur in prime focal areas (for Barber quarters, Liberty's cheek and neck, as well as the fields to either side of the bust). 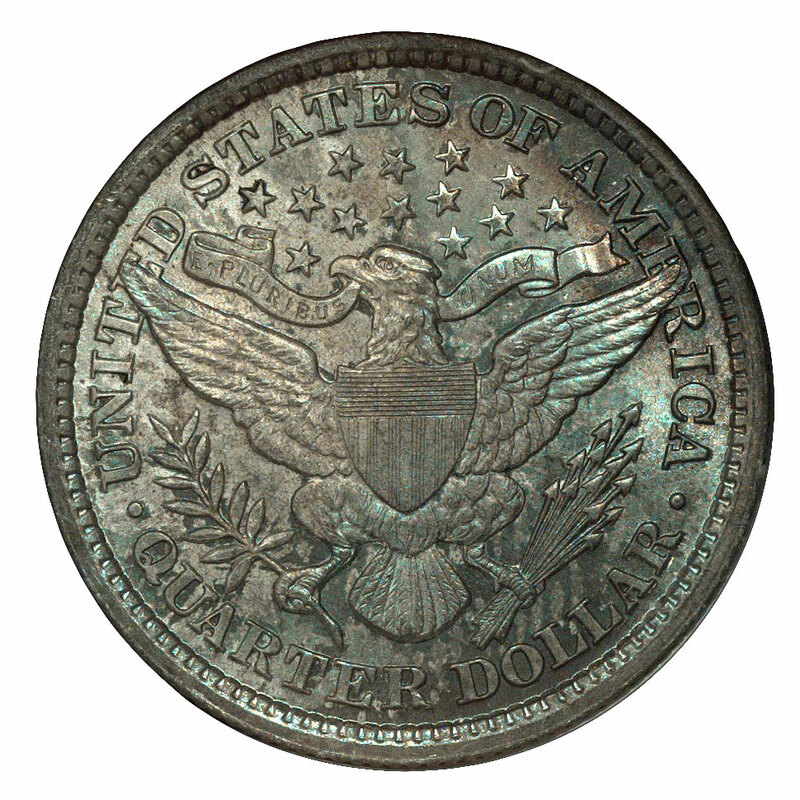 The factors which are most likely to cause a mint state Barber quarter to be downgraded are contact marks and hairline scratches. Most surviving pieces were bagged and shipped with no particular care, suffering numerous blows from their neighboring coins. Once these coins did acquire some collector value, decades later, they were typically stored in either paper envelopes or cardboard coin albums. While many writers have blamed the sliding plastic windows of coin albums for imparting hairline scratches on the surfaces of coins, I suspect that most of these flaws resulted from the coins sliding around in envelopes or being wiped with a cloth in a clumsy attempt at cleaning. Hairlines are most distressing when found on proof coins. The brilliant fields of proof Barber quarters may be damaged with just the slightest friction, and the vast majority of surviving proofs are flawed to some extent. Another problem often seen on proofs is that the frosted devices common to the earlier period (1892-1901) have had some of their matte texture disturbed by nicks or abrasions, leaving unsightly bright patches. Later proofs are more fully brilliant, and hairlines become a problem for both fields and devices.